In it for the long haul. It's well known that hydration plays a fundamental part in your performance, especially for endurance activities; however it's not always ideal to carry lumbersome baggage, stop, pull out a water bottle and start back up again on your running trail. 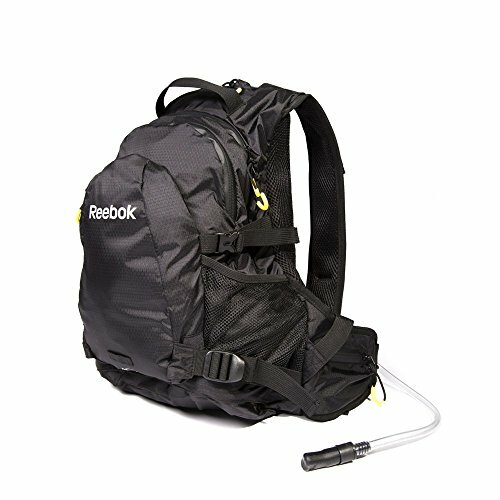 The endurance hydration backpack from Reebok offers a convenient and effective way to hydrate whilst on the move, thanks to its easy-to-access 2L hydration pack with Bite valve. This valve is both easy to remove and easy to clean after use. Fully waterproof, the Reebok running backpack features a large main compartment plus 5 internal pockets and a hydration sleeve with zips, so there's plenty of storage to keep all of your essentials safe and secure for your long-distance run. You'll also be able to reach your smaller valuables and energy snacks via the bag's easy access side pockets. Altogether, the bag's full capacity is 27L. Ergonomically designed, the endurance hydration backpack features an adjustable padded shoulder plus waist straps, enabling the bag to mould to the shape of your back whilst remaining secure and stable throughout your run. What's more, as the sun's setting, you can add an LED light to your backpack using the integrated light bracket for added visibility for the duration of your run. Whether you're a recreational endurance runner or small day-hiker, the Reebok endurance hydration backpack is a highly functional trail bag that doesn't compromise on comfort or practicality.